This workshop is FULL and is no longer accepting registrations. Place: 2665 Marine Way, Bayside Business Plaza, Conf. Rm., Mountain View **Please bring your own lunch to the workshop. Questions about this course may be directed to Dr. Marotta at Janetti@JanettiMarotta.com. Many mental health professionals lead support and psychoeducational groups for bipolar illness, parents of teens, and infertility in HMO, agency, medical, and community settings. This workshop will focus on the formation, leadership skills, clinical dilemmas, and therapeutic factors of support and psychoeducational, interpersonal process groups, and hybrid group models. This workshop will be both didactic and experiential. Describe the difference between support groups, psycho- educational groups, process groups, and hybrid model groups. List the fundamentals of group formation for support, psychoeducational, and process groups. List therapeutic goals and intervention strategies for support, psychoeducational, and process groups. Describe the challenges and clinical dilemmas for support, psychoeducational, and process groups. Utilize therapeutic factors in support and psychoeducational groups by integrating interpersonal group process and mindfulness practices. 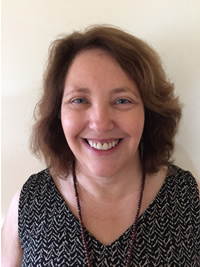 Cathy Miller, LCSW is an Advanced Clinical Social Worker at Stanford Health Care where she co-chairs the Social Work Internship program and serves on the Heart Transplant Patient & Family Advisory Council. Ms. Miller has led psycho-educational and support groups in medical settings for over 20 years. Many mental health professionals lead support/psychoeducational groups of various types (e.g. cancer survivors, infertility, and self-esteem) in HMO, agency, medical, and community settings. This workshop will focus on the fundamentals of support/psychoeducational groups including group formation, leadership skills, challenges/clinical dilemmas, and therapeutic factors. After completing the workshop, participants will be able to describe the difference between support groups, psychoeducational groups, interpersonal process groups, and hybrid group models. Skills to increase therapeutic benefits in support/psychoeducational groups will be emphasized. This workshop will be both didactic and experiential. Group services in a variety of settings appear to be an effective therapeutic intervention (Burlingame, Fuhriman, & Mosier, 2003; Holmes & Kivlighan, J., 2000). In comparison to individual treatment or standard health care, group therapies have been found to be cost-effective (Lamb et al., 2010), linked to lower dropout rate (Minniti et al., 2007) and determined time efficient in terms of serving more individuals at once (Sobell, Sobell, & Agrawal, 2009). Significant therapeutic factors are linked to group therapy (Yalom, & Leszcz, 2006), and therapeutic benefits of psychotherapy can be enhanced through mindfulness practices (Germer, Siegel & Fulton, 2013). This course will increase the knowledge and skill level of clinicians who lead or are planning to lead support/psychoeducational groups in a variety of settings. Burlingame, G., Fuhriman, A. & Mosier, J. (2003). The differential effectiveness of group psychotherapy: A meta-analytical perspective. Group Dynamics: Theory, Research and Practice, 7, 3-12. Holmes, E. & Kivlighan, J. (2000). Comparison of Therapeutic Factors in Group and Individual Treatment Processes. Journal of Counseling Psychology, 4, 478-484. Lamb, S, Hansen, Z., Lall, R., Castelnuovo, E., Withers, E., Nichols, V., et al. (2010). Group cognitive behavioural treatment for low-back pain in primary care: A randomized controlled trial and cost-effectiveness analysis. Lancet, 375(9718), 916-923. Minniti, A., Bissolli, L., DiFrancesco, V., Fantin, F., Mandragona, R., Olivieri, M., et al. (2007). Individual versus group therapy of obesity: Comparison of dropout rate and treatment outcome. Eating and Weight Disorders: EWD, 12, 161-167. Sobell, L.C., Sobell, M.B, & Agrawal, S. (2009). Randomized controlled trial of a cognitive-behavioral motivational intervention in a group versus individual format for substance use disorders. Psychology of Addictive Behaviors, 23, 672-683. A randomized controlled trial and cost-effectiveness analysis. Lancet, 375(9718), 916-923. I. Introduction to psychoeducation groups. B. Therapeutic goals and intervention strategies. A. Demonstration group (20 min.). B. Debriefing and discussion of demonstration group. III. Introduction to support groups. V. Introduction to interpersonal process groups. VI. Demonstration interpersonal process group. VII. Introduction to hybrid groups. A. Therapeutic goals and intervention strategies.